Fluorspar Market Size was estimated over USD 2 billion in 2016 and will exhibit growth by a CAGR of over 4% up to 2024. The global fluorspar market will witness steady gains during the forecast period owing to the products usage as a raw material in the production of hydrofluoric acid, which is a precursor to almost all fluorine compounds. Fluorspar usage in the production of steel and aluminum will also be a major factor behind its market growth. The product, also commonly known as fluorite, is the mineral form of calcium fluoride. Rising fluorochemicals demand from a range of end-user industries along with increasing production of aluminum and steel will propel the global fluorspar market growth during the forecast period. The majority of the hydrofluoric acid is produced by treatment of fluorspar with concentrated sulfuric acid. Hydrofluoric acid has a wide range of applications such as in mining, industrial chemistry, refining, silicon chip manufacturing, cleaning, glass finishing, etc. Hydrofluoric acid is used as a catalyst in oil refining process. It is also used in the production of organofluorine compounds as well as other fluorine-based chemicals. These fluorine compounds are extensively used as refrigerants and in air conditioning. These factors will boost hydrofluoric acid demand in the coming years which will in turn propel the fluorspar market growth in the forecast period. The environmental concerns related to fluorite mining, which is mostly carried out using the blasting process, may hinder the fluorspar market growth during the forecast period. Air and ground vibrations from the blasting process is an undesirable phenomenon and other mining methods were introduced to reduce the instances of blasting during fluorspar mining. Other factors that may hinder the industry growth are the poisonous nature of fluorine gas and high corrosivity of hydrofluoric acid. The fluorspar market, according to product, has been segmented into acidspar, metaspar, ceramic grade, and others such as natural fluorspar, crystals, etc. Acidspar contains over 97% calcium fluoride and is mainly used in the production oh hydrofluoric acid which is then used to manufacture a variety of products including foam blowing agents, fluorocarbon chemicals, refrigerants, fluoride chemicals, etc. This is the largest product segment which is likely to grow with a CAGR above 4.5% during the forecast timeframe. Ceramic product segment in fluorspar market valued more than USD 10 million in 2016. The ceramic grade contains 85% to 96% calcium fluoride and is mostly used in the production of ceramics, specialty glass, and enamelware. The product is employed to make surface treatments and glazes to obtain opalescent and hard glossy surfaces along with other appearances that make glass objects more durable and attractive. Based on application, the global fluorspar market is segmented into aluminum production, steel production, hydrofluoric acid production and other minor applications such as ornamental & lapidary, optics, etc. Hydrofluoric acid production accounted for the majority of the fluorspar market share in 2016 and will hold sway during the forecast timeframe. This segment will grow by a CAGR exceeding 4% during the forecast period. Aluminum production application segment accounted for more than 15% of the overall fluorspar market share in 2016. Automobile demand has witnessed fast growth owing to increasing income levels in the emerging economies. The aircraft manufacturing industry has also witnessed fast gains owing to growing number of air passengers in the world. These factors coupled with increasing defense spending in most of the countries around the globe will bolster aluminum demand and in turn enhance the aluminum production application segment’s market growth. North America fluorspar market will witness growth of more than 3.5% CAGR during the forecast period. The U.S. is the one of the largest consumers of the product and due to the absence of large sources of fluorspar in the country, most of the product is imported from Mexico. The product is mainly used in the U.S. to manufacture hydrofluoric acid and other fluorine compounds. The high growth observed in the U.S. oil & gas sector in the last few years will increase hydrofluoric acid demand for refining actives which will have a positive effect on the fluorspar market. Europe is significant fluorspar market accounting for more than 15% share of the overall industry share. Germany, Italy, and France will drive demand for the product in the forecast timeframe. Increasing steel demand from a rapidly rising construction industry in Europe, mostly in the Eastern European region, will spur demand for fluorite to be used in steel production. Latin American market will witness steady gains of more than 3.5% CAGR in coming years. Proximity to Mexico, which is a second largest producer of fluorspar, will increase product processing activities in the region which will contribute towards the fluorspar market growth during the forecast timeframe. The key participants in the fluorspar market includes Mexichem, Centralfluor Industries Group,Inc., Zhejiang Wuyi Shenglong Flotation Co., Ltd, Minersa Group, China Kings Resources Group Co.,Ltd., RUSAL, Seaforth Mineral & Ore Co., Kenya Fluorspar Company Ltd., British Fluorspar Ltd, Steyuan Mineral Resources Group Ltd, Masan Group, Mongolrostsvetmet LLC.,Ying Peng Chemical Co.,Ltd, Canada Fluorspar, and Groupe Managem. Acquisitions are an important strategy that fluorspar market participants use to increase their industry presence and gain excess to new markets. Fluorspar is a mineral composed of calcium and fluorine and is used for a variety of metallurgical, chemical and ceramic processes. They are also sometimes cut into gems to be used in ornamental objects. China, Mexico and Mongolia are the largest fluorite producers in the world. Asia Pacific will drive the fluorspar market growth owing to the presence of a large number of steel & aluminum manufacturing plants in the region. 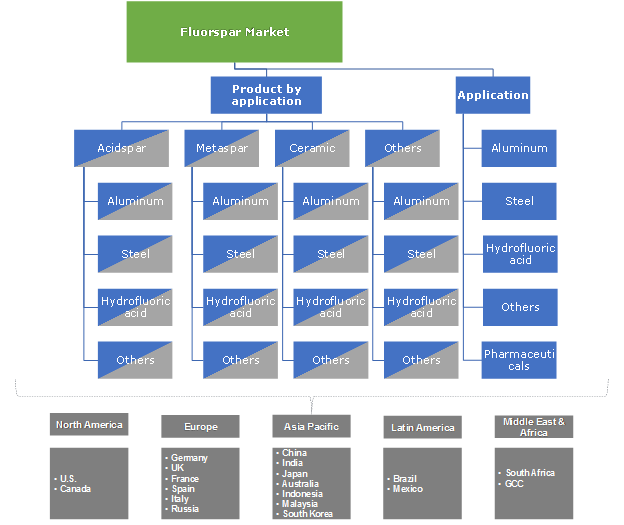 The high demand for fluorochemicals in a wide range of applications will also help the fluorspar market to grow during the forecast period.